Audio description is finally available for almost all first-run movies, and more and more movie theaters are being built or renovated with the necessary equipment to offer the description track to patrons. In fact, the law now requires them to upgrade to include description equipment. This page will point you to more information about the process, the movies, and the theaters. Last updated: Feb 15, 2019. BYO AD Track With Actiview! The following "Final Rule" was signed in December 2016 and became effective June 2, 2018. Public accommodations with movie theater auditoriums showing digital movies on December 2, 2016 must comply with the rule's requirement to provide closed movie captioning and audio description in such auditoriums by June 2, 2018. If a public accommodation converts a movie theater auditorium from an analog projection system to a system that it allows it to show digital movies after December 2, 2016, the public accommodation must comply with the rule's requirement to provide closed movie captioning and audio description in such auditoriums by December 2, 2018, or within 6 months of that auditorium's complete installation of a digital projection system, whichever is later. The president of the ACB, Kim Charlson, was interviewed in February 2015 for a segment on Boston's WGBH television, the local PBS outlet. She emphasized how valuable audio description has been for her in the enjoyment and complete appreciation of movies. The Department of Justice proposal requiring movie theaters to install description and captioning equipment was addressed, too. You can view the 4 minute segment below (click it), read the article in print, or click here for an audio version. Another ACB member, Carl Richardson, also enjoys going to movies that feature audio description. He was featured in an article in the Boston Globe entitled, Devices give blind filmgoers Oscar-worthy experience. And an independent New Hampshire theater added accessible films for people with sight or vision impairment, while a Connecticut theater welcomes people with disabilities. About ten years ago, movie theaters began converting from film projectors to digital, each with a server that processes and distributes the movie data, including audio description tracks. Each month, more and more movie theaters install one of these systems, making the audio description available to people who need it. 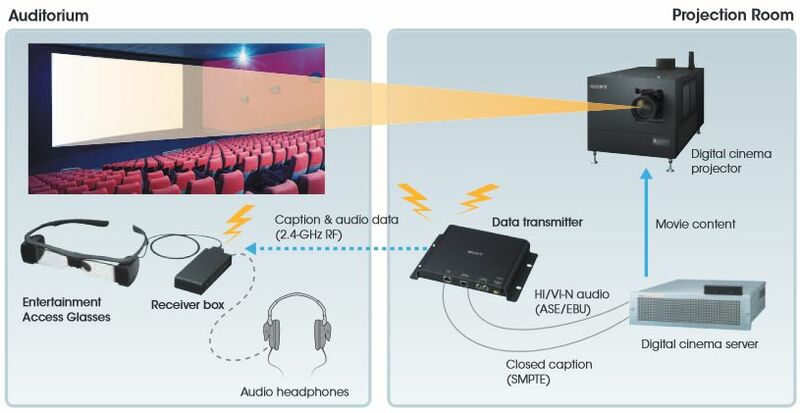 With digital, everything (movie, multiple sound tracks, and captioning) are all delivered in something called the Digital Cinema Package (DCP), which any company can access through common standards, so the competition for equipment is increasing and the cost of installation is decreasing. One DCP can server multiple screens in a movie house. While the DCP is currently a physical product (a hard-drive), eventually the data will be delivered to movie theaters via satellite. A separate Doremi product, CaptiView, is used for closed captioning. Sony has its own system which uses special glasses and earpieces. Typically a theater chain uses one system or the other in all of its cities. Here's what the Sony system (model Sony STW-C140GI, used by Regal and others) looks like. When glasses are plugged in, it puts the captioning on the glasses; when an earpiece is plugged in, the user hears audio description. Formerly, WGBH Media Access and DTS Access offered a DVS Theatrical Player for description and captioning. The WGBH system offered closed captioning via a separate system called Rear Window® Captioning (RWC), while the DTS Access system offered open captioning on-screen via a special projector. These systems are being phased out and replaced by digital products not marketed by either company. However, WGBH Media Access, as the dominant provider of movie description tracks (over 1200 so far), uses the term MoPix to cover the creation of the tracks, and they are very much in that business. There are some real "good guys" in the history of making audio description tracks available, for example, AMC and Regal. Cinemark, the third largest theater chain in the United States, engaged in a process called Structured Negotiations with its blind patrons and the California Council of the Blind in 2012, and now has audio description equipment in every first-run auditorium it operates in the country (press release). But other companies have often resisted offering description and captioning, even when the equipment was readily available to them (through the conversion to digital). In part, this resistance is what triggered the Proposed Amendement to ADA Affecting Movie Theater Accessibility in July 2014. This ended up with the Justice Department signing a "Final Rule" in December 2016 (effective June 2, 2018) affecting the ADA Title III, as summarized at the top of this page. Availability of proper equipment and staff training have been a huge issue, and AMC reached a settlement in this regard in the spring of 2017. In late 2017, the court ruled against Cinemark in a suit brought by a deaf-blind patron who wanted a tactile interpreter. Many people are frustrated by being given the wrong equipment for AD at the cinema. Read this great post on our Discussion List on how to maximize your chances for getting the correct equipment. Actiview is an app for iPhones or Android devices which provides audio description tracks for a growing number of movies. It can be used in a movie theater (so you don't have to worry about equipment failure) or at home with a DVD or streaming service like Hulu, which might not have audio description. Read this article about Actiview. We maintain a full list of Actiview titles, and the titles are also incorporated into our Master AD List. And OUTSIDE THE USA you should know that there are three other similar services: Germany (Greta & Starks); Italy (MovieReading, with an occasional English track); and India (XL Cinema). These are all mentioned at the bottom of this page. How Many Films Are Described? WGBH Media Access tells us that "All major studios now caption and describe all wide released features and nearly all independent studios caption all releases." Not all of that description makes it to DVD, however; but some studios like Sony, Disney, and Universal have been providing it with almost all of their releases since 2010, followed later by Fox, Lionsgate, and Warner Bros. It's tough to get the smaller, independent studios to fund description of either movies or DVDs. Currently a few major studios (and some smaller ones) don't provide DVD description either; for example, Anchor Bay Entertainment / Weinstein Co, Alchemy (formerly Millennium), Miramax FIlms, and Pure Flix. Write them! So what happens when a described movie ends its run and is released on DVD and Blu-ray discs? Historically, very few described DVDs were released, but that changed dramatically starting in late 2009. Read more about this and how to order DVDs on our DVDs page. You will also find a huge number of described movies on iTunes. A good source for finding described videos is CaptionFish. Just use the filter to select Descriptive Video. A number of site visitors have also recommended Fandango. The iOS App works reportedly works well, or you can search the website by location or movie name, and by signing up for a free account, you can save and navigate to your favorite movie theaters. When you find a specific movie, navigate to the phrase, "Select a movie time to buy tickets." If you down-arrow at this point, you are hoping to find the phrase, "Accessible devices available." Clicking that link should produce a pop-up box with either or both "Closed caption" and "DV" (which stands for Descriptive Video). You, of course, are hoping to find DV listed for the film in question! As a point of information, after each theater name there is a link labeled Amenities. If they have audio description headsets, "Accessibility devices available" is supposed to be listed there, but has not proved to be reliable. If you want to do a search on the page for described movies, you may wish to search for the phrase "accessibility." When you pay for your movie ticket, ask for an AUDIO DESCRIPTION headset; but make sure it is for audio description, not Assisted Listening Devices for people who are hearing-impaired! The following listings pertain primarily to the USA and Canada. iTunes now offers over 700 movies with audio description tracks. Please see our listing of described movies on iTunes which also contains information on how to identify movies with description. Netflix offers description for over 500 original shows, documentaries, TV series, and children's programming. Please see our listing of described programs on Netflix. Also see also how to activate Netflix description. (read our article about MFTB! Actiview is a system for listening to audio description in movie theaters on your own smartphone (article on Actiview). We discuss Actiview earlier on this page. Do you speak German? A company called Greta & Starks offers a free IOS or Android app with description tracks for over 100 movies in German. Do you speak Italian? MovieReading is a free app offering audio description tracks for a limited number of films in Italian. Note that there are a small number of English language film tracks available also, but the website is only in Italian. We are awaiting further information. Solo-Dx was a short-lived service in late 2013 which produced only one description track (Philomena) to be accessed in-theater on a personal iPhone. Parlamo worked on providing a similar service; however, they appear to be out of business as of 2018. The Disney Movies Anywhere App offered description tracks for Pixar movies but was discontinued in 2018. For audio described movies and DVDs outside the USA, see our International page.